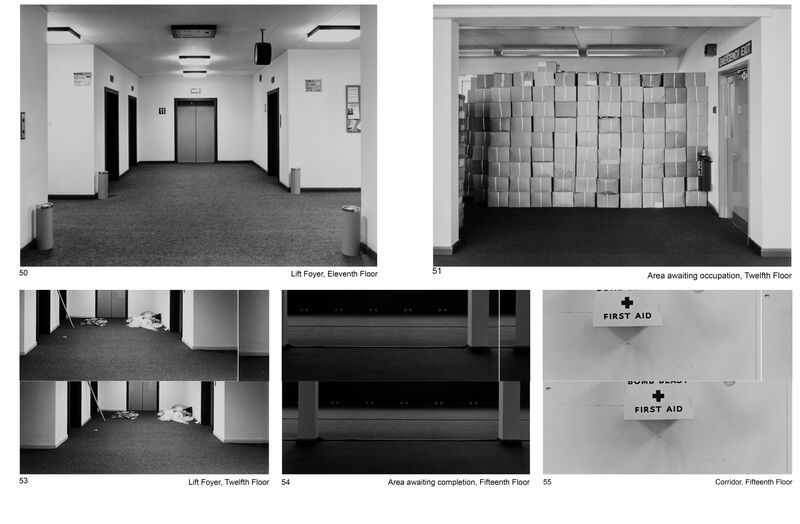 The images here are from a series of 63 exterior and extensive interior photographs of a government building, ‘a Crown Building’ more precisely, to give it its correct status, and located within the UK. The work was made in 1982 over a period of several weekends, working with a 5×4 view camera. Due to the nature of some of the material involved, I was always accompanied by security staff. The series would culminate with four exterior views made from the top floor corresponding to the opening exterior photographs. I didn’t make a full survey of the building initially, but rather decided to allow the interior to reveal itself and its potentials as I progressed. The notice on the rear wall of 21 reads ‘Look, Think, Suggest’. ‘PBX’, relates to telephone communications. The grid on the white board in 39, shows days of the week, against the names, ‘Graham, Jean, Dave, David, Liz, and Peter’. 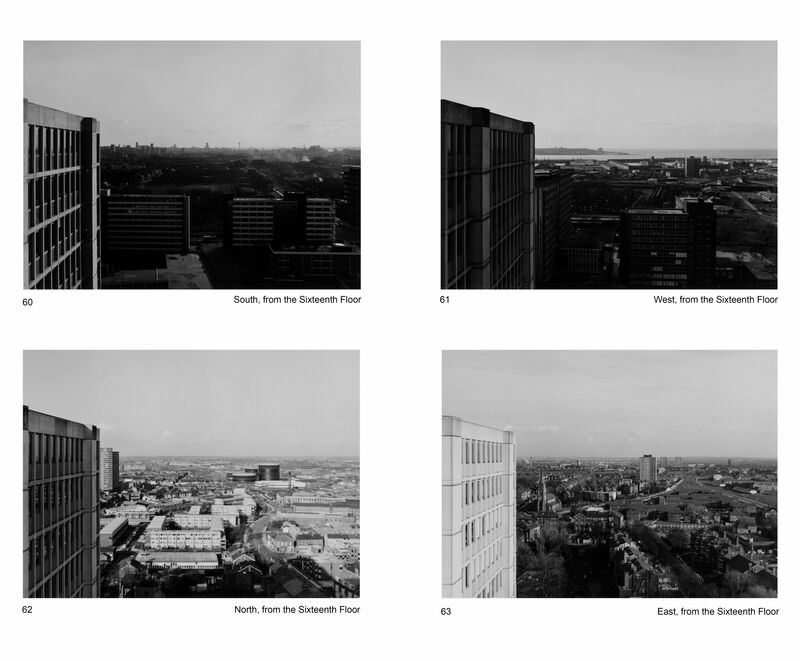 The four exterior views from the sixteenth floor. 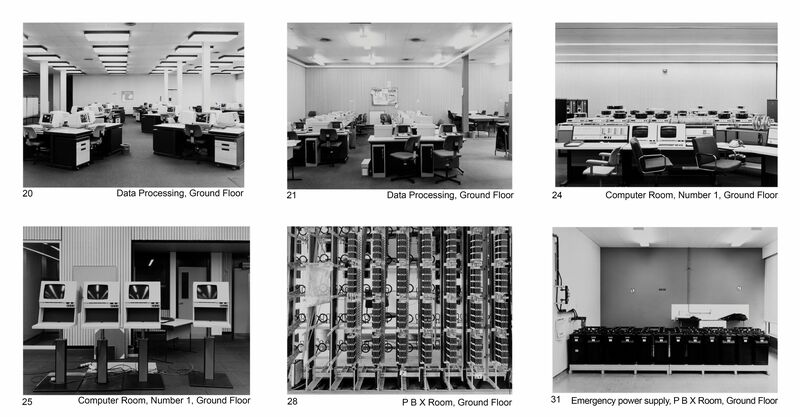 The work was first shown in its entirety at the IKON Gallery in Birmingham in 1985, as part of a two person show ‘ Corporate Image’ along with Paul Highnam’s photographic work ‘The City’. 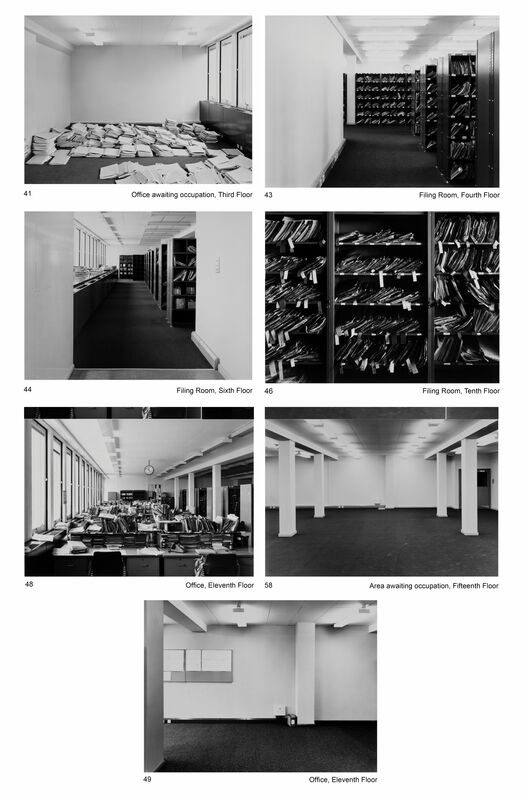 The following year ‘Corporate Image’ was shown at The Axiom Centre for the Arts, with a catalogue introduction by John X Berger. Some of the photographs from ‘A Crown Building’ were also included in a ‘Photographer’s Gallery’ exhibition ‘Image and Exploration’ and the exhibition catalogue. The stringent security measures in place today make it unlikely such a project could be easily made again. Even then in the early 80’s, I was advised to take legal advice to ensure that either I would not be liable to prosecution or have the work pulled from any subsequent exhibition. Following that advice I did in fact decide to not include one particular photograph. This photographic project could not possibly have been undertaken without the help and support of ‘Mac’, to whom I shall be forever grateful. East Midlands Arts generously provided a grant towards exhibiting the work.